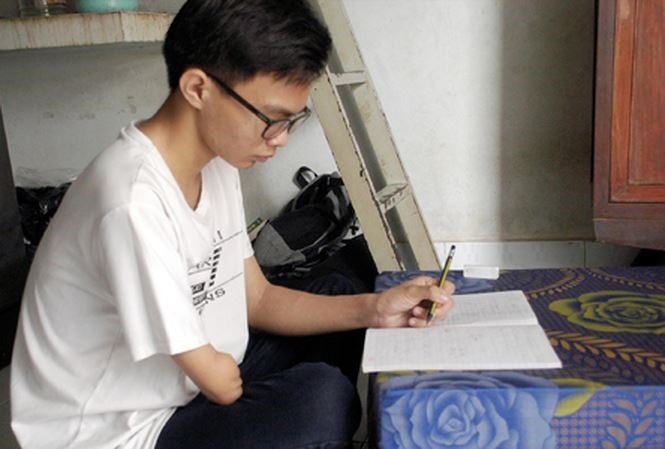 CẦN THƠ — Despite his disability, Nguyễn Chí Bền came first in the entrance exam to Cần Thơ University for the school year 2018-19. The young man has worked hard to overcome his disability, taking after his name Chí Bền, which means durable will. Bền was born in Rạch Giá in the southern province of Kiên Giang. He is the only child of a family which sells seafood. When he was five years old, the young boy played with an ice cutting machine, and lost his right hand. His family took him to hospital with hopes they could reattach the boy’s limb, but doctors were unsuccessful. One year later, Bền started primary school like many kids his age, but he found the work too difficult. Bền practised writing with his left hand, but it was too hard for him. “Sometimes I threw my pen away, because it was too hard to write. Then my mother encouraged me to try gradually. I continued to strive,” said Bền. Although writing with his left hand, Bền’s handwriting is beautiful. When Bền was in first grade, he was marked just 4 or 5 for dictation, because his teacher believed that someone helped him to write. Bền’s family took him to the teacher’s house so that they could witness Bền writing. After that, the teacher increased Bền’s mark to 8 or 9 instead. Phước Hạnh Kiều, Bền’s mother, said that although Bền lost his right hand, he did not lose his willpower. He is very hard working and self-aware. He always achieved good results at school. He got third prize in a provincial mathematics competition. “When Bền passed the entrance exam to university, I was so happy that I burst into tears,” said Kiều. Although he is disabled, he is still optimistic and is determined to better himself. His school results are proof of this, said Thủy. Bền’s secret is finding different references on the internet and never giving up when finding his work difficult. Bền wishes to become a teacher to spread his knowledge to the next generation. The small boy can now follow his dream after getting good marks in the entrance exam to Cần Thơ University. He is now a student of the Physics Faculty. “Studying is the only way to help me have a better life,” said Bền. “If you love me, don’t love me like a disabled person. Let me think that I’m like you,” Bền told his friends.